HomeUncategorizedTHRASH METAL MADNESS: ROUND 2! Round 1 of Thrash Metal Madness has come to an exciting end. 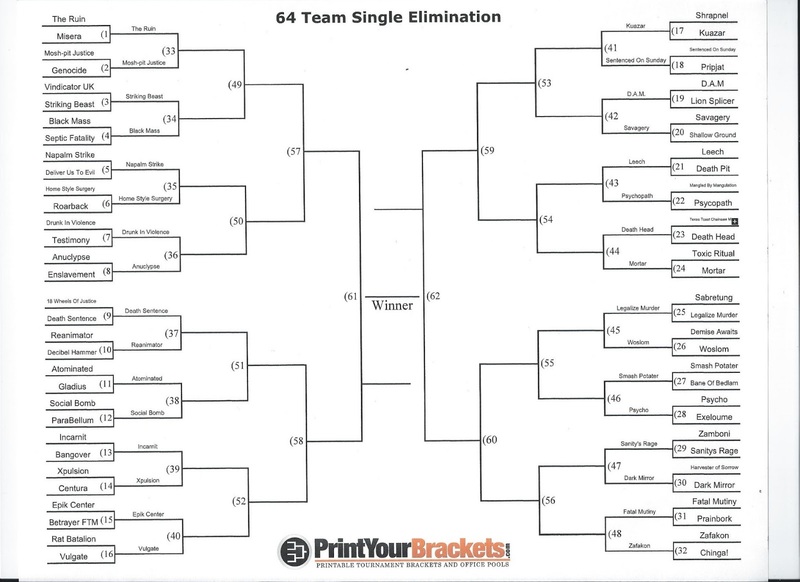 Thousands of votes were cast but sadly only 32 of the 64 bands competing remain. I want to take this time to thank everyone who has participated in this event I sincerely hope all the bands involved got a ton of exposure and picked up a boat load of new fans as well. I wish you all the best of luck with your future musical endeavors and if any of you ever need anything, you know where to find me! With that said let the games begin once again! Round 2 has officially begun! Like the previous round fans will be able to vote once a day until voting ends Sunday March 31st at 12PM EST. Best of luck to you all and remember, keep those comments clean! 2 Comments on THRASH METAL MADNESS: ROUND 2! This competition is truly putting all the bands to the test!!! Best of luck to everyone. There is a serious problem with the locking out of multipal voters. I don’t know about other contests but the Dark Mirror vs Sanity’s Rage one keeps telling everyone they’ve already voted. Even people who have never voted before. Also, at what time does it reset? It should be something like 12:00 GMT. If it is set for one vote every 24 hours, that is not working either. It’s not fair when people try and try to vote and keep being told they already did. They get discouraged and don’t bother. This contest is too close to be lost because of a site glitch.